Pickled veggies displayed prior to consumption. Given that I’m not a morning person, I usually prepare the day’s lunches the night before. Tonight I was making Thai spring rolls, and had some sliced green peppers left over. And given that I have a waste not, want not philosophy when it comes to food, you know I had to use them up somehow. So I made some pickled vegetables! Want to make some too? They’re the work of a few minutes only! Mix vinegars, water, and all spices (so everything but the veggies) in a bowl and heat in the microwave for 3 minutes. The pickling brine should be nice and hot when you pour it over the chopped vegetables in a large bowl. Make sure to press down the veggies so that they all get bathed in the brine; I stirred and pressed down gently with a potato masher, repeatedly for about 5 minutes. Then I scooped the veggies into sterilized jars, making sure to top up with brine to cover all the veggies in the jar. Let them sit for at least overnight. And then voila — condiment time! 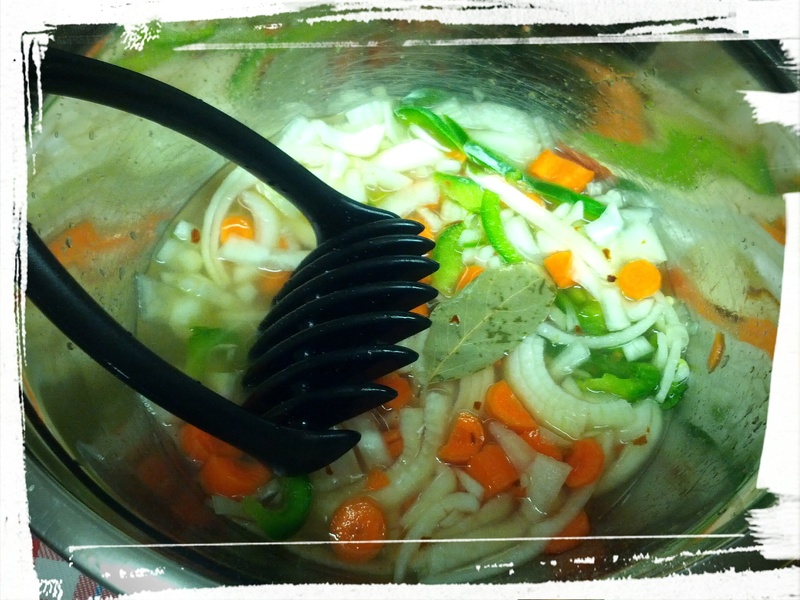 Stirring the veggies with the pickling juice. I used these quantities and ended up with just the right amount to fill three half pint jars. 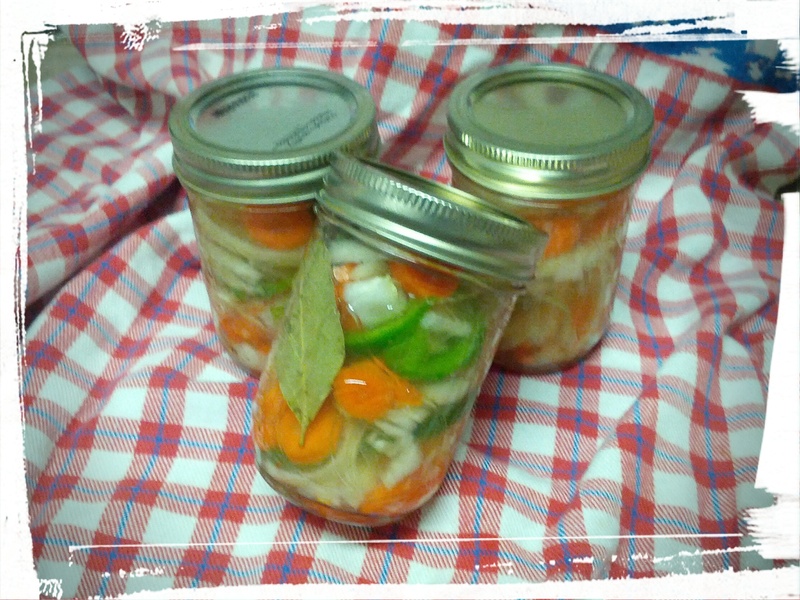 Given that I fully expect to eat these pickled veggies within a few weeks, I only sterilized the jars in the microwave. I’ll keep the jars in the fridge until used, but had I done a quick water bath, they would be properly canned and could stay on my cupboard shelves for several months. But they’re too tasty to last that long! Now, what shall I use these pickled recipes on? I shall probably use it as a topping for veggie burgers, sandwiches, and salads. I’ve used previous batches on pizza, which was surprisingly delicious with crumbled feta. Mmm…now I want to eat! Maybe I’ll just eat one of the Thai spring rolls that I had leftover from tomorrow’s lunch prep. Yes, that’s what I’ll do! Next Post: Cherry Pie, a la Francais! Followed by homemade copycat oreos. Chocolate-dipped copycat oreos. So. Good! Post-Pub Edit: Do link-ups work? Bloggers say that they increase blog traffic, and hey, I’m all for that! So this is now my contribution to Christy Jordan’s latest link-up. This entry was posted in Preserves, Uncategorized, Vegetarian Side Dishes, Waste Not Want Not on August 10, 2015 by Margaret.